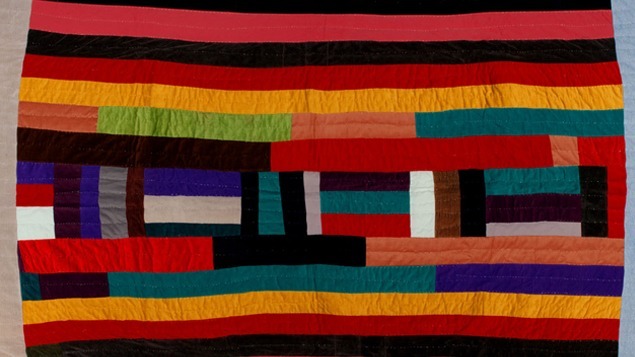 Until recently, the quilts of Gee’s Bend were the exclusive products of thrift and necessity, assembled from discarded fabric scraps and created to “keep the children warm.” Yet these internationally esteemed quilts have also been lauded in The New York Times as “some of the most miraculous works of modern art America has produced” and call into question the old paradigm of what constitutes art. Quiltmaking has been a longstanding tradition among the women of Gee’s Bend. Until the Roosevelt era, the community lived in log cabins where one could “see the stars” and feel the wind and rain through gaps in the ceilings and walls. At the same time, quiltmaking was a rare opportunity for creative personal expression. The 700 residents are almost exclusively the descendents of the enslaved workers of cotton plantation owner Joseph Gee, whose land was located in the hairpin bend of the Alabama River referred to locally as “Gee’s Bend.” Gee’s Bend’s relative isolation largely due to its topographical location helped preserve the local culture and traditions, allowing them to evolve uniquely and independently. Today, the quilters are free to explore their creativity as artists and not merely as homemakers. The innovative pattern variations, reinterpretations, and abstract designs, which are rooted in tradition are very much their original artistic expressions.